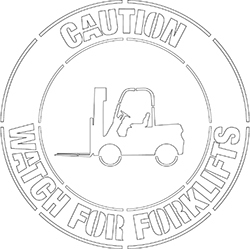 This is a stencil that says, “Caution – Watch for Forklifts” and will serve as an excellent reminder to everyone in the area that there are forklifts that drive through the area. Most modern forklifts operate using a very quiet motor so people often can’t hear them approaching unless the driver sounds the horn. When working on improving forklift safety, everyone has to work together to reduce the chances of an accident or injury. Having a floor marking like this will help ensure people are always looking around to ensure there are no forklifts approaching. Even better, it can help encourage people to use a different path to get where they are going so they aren’t walking in an area where a forklift may be present. Using this stencil to alert people to the presence of forklifts is an excellent way to help improve safety in your facility.